At the end of October, the Premier of Tuvam sholban Kara-ool will meet with the president of Mongolia, Tsakhiagiyn Elbegdorj. The head of the border region of Russia received an official invitation to visit Ulan-Bator from the new government of Mongolia in June of theis year. Tuva, there fore , plans to re-establish once-close economic and cultural ties with their neighbors, which were interrupted during the “perestroika” years. Altai Kray and Republic Tuva will soon sigh an Agreement of Co-operation. In the sphere of mutual interests is the development of internal tourism, as announced today by the chairman of the government of Republic Tuva, Sholban Kara-ool, who came to Barnaul to participate in the meetings of the governmental committee for questions of regional development, which premier-minister RF, Vladimir Putin, is conducting here. Tuvan Prime-Minister Sholban Kara-ool gave a press-cinference at Russia's largest Information Agency - RIA NOVOSTI in Moscow. It is the first press-conference ever given by a Tuva's head on a federal news-platform. 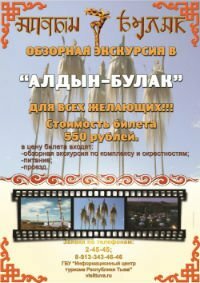 'In 1970 when all over Russia Lenin's 100 jubielum was celebrated, Tuvan Party Committee gave an assignment to local historian to find something connecting Lenin and Tuva, - Kara-ool started unexpectedly. - The historians did a lot to fulfill the task searching for a bit of Tuva in 54 volumes of Lenin's works and a mass of memoirs of his colleagues and finally found a short line in his letter from Siberian exile adrressing his wife Krupskaya. 'I write these lines. It is dark outdoors. Winter. Some kilometers further is Shush river (400 km Tuva's north), beyond which nothing. The world's end'. The 12-hour symbolic fasting and prayer service for global peace, happiness for all humanity, relieve Tibetans suffering torture and oppression under the Chinese government, was observed across many regions in Russia. Tuva: In Tuva republic, abbot of Gaden Shartse, Geshe Lobsang Thupten presided over the 12-hour prayer service and symbolic fasting, attended by around sixty local Buddhists at the city center hall. Tuva voted for a new president on Sunday in an election likely to hand victory to President Vladimir Putin's chosen successor but criticised by the opposition for a lack of real competition. 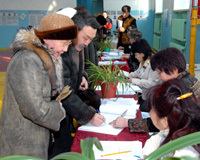 Turnout at presidential polls hit 59% as of 2 p.m. Tuvan time, and exceeded 70% by the end of the vote. Only 9 out of 182 election polls protocols have been processed by the time and they show most voters want to reward Putin for eight years of rapid growth and rising wages by backing Medvedev. The Russian Central Election Commission on Friday registered 442 candidates as deputies of the fifth-convocation State Duma. The election process is concluded with the procedure, commission secretary Nikolai Konkin said. There are eight seats more, and the commission is waiting for documents from candidates, as five days remain to submit them, he added. Fifty seven communist deputies, 40 from the LDPR, 38 from the Just Russia party and 307 from United Russia are registered as of this Friday, Konkin said. Finance minister Radislav Bayan, 43, was the last from Sher-g-ool Oorzhak's team to leave the government. Yesterday his resignation was accepted at the session of the Tuva government. He was announced to go back to the bank sector, from where he was appointed to the government in 1997. Today a new finance minister Yuri Kilizhekov, 42, received a parliamentary approval for his appointment. Yury Kilizhekov had been first deputy-minister of finances..
Yury Kilizhekov graduated from the Ural State University. He is Candidate of Mathematical Sciences. Polls to the mayor of Kyzyl, the capital of Tuva, were declared illegal by the head of the republic. 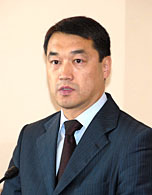 As the official Web site of the Tuvan Government reported, Sholban Kara-ool stated that the intention of Kyzyl Khural (town council) to elect a mayor as a result of contest selection contradicts to the federal law "About the general principles of local self-government management in the Russian Federation". It was Tuva that was chosen by President Vladimir Putin out of 88 Russian regions to host Monaco Prince Albert for a 3 days-holiday. Interesting to note that just before this high visit, on August 12, it rained heavily in Kyzyl, where the last 2 weeks the temperature stayed at +30-35 (Celsium). Kyzyl residents thought the rain a sign for the weather change but on the next morning the sky was again virgin blue and the temperature quickly recovered from +13 to its +30-34 (Celsium) and stayed like this during the whole visit. 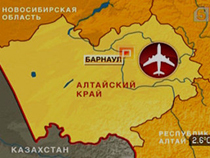 The airplane 'Russia' landed in Kyzyl airport at 10.05 a.m. August 13. The high guests were greeted by Sergei Shoigu, federal minister for emeregency situations, native of Tuva, and Sholban Kara-ool, head of the republic. 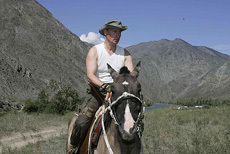 Putin and Alber the Second several minutes after the arrival mounted a helicopter which was taking them from one beautiful place in Tuva to another. Tuva's Prime-Minister Sholban Kara-ool gave his annual address to both houses of the Tuvan Great Khural. Speaking before the lawmakers, Kara-ool paid a special attention to key-problems in socio-economic development of Tuva, presented his view on its prospects.The Tuvan leader delivered his speech two days after his 100 days in office expired. He devoted it to an economic analysis of the situation in Tuva as well as his recommendations for the future.